WASHINGTON -- The Supreme Court upheld the use of a controversial drug in lethal injection executions Monday, as two dissenting justices said for the first time that they think it's "highly likely" that the death penalty itself is unconstitutional. 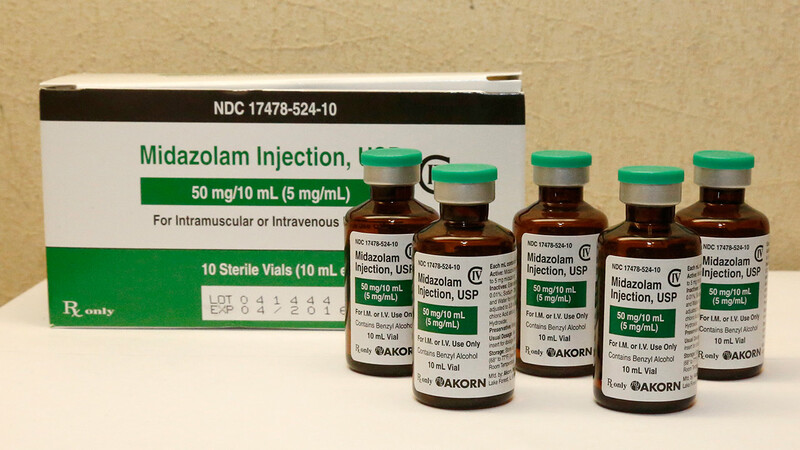 The justices voted 5-4 in a case from Oklahoma that the sedative midazolam can be used in executions without violating the Eighth Amendment prohibition on cruel and unusual punishment. The drug was used in executions in Arizona, Ohio and Oklahoma in 2014 that took longer than usual and raised concerns that it did not perform its intended task of putting inmates into a coma-like sleep. Justice Samuel Alito said for a conservative majority that arguments the drug could not be used effectively as a sedative in executions is speculative. In dissent, Justice Sonia Sotomayor said, "Under the court's new rule, it would not matter whether the state intended to use midazolam, or instead to have petitioners drawn and quartered, slowly tortured to death, or actually burned at the stake." Alito responded, saying "the dissent's resort to this outlandish rhetoric reveals the weakness of its legal arguments." In a separate dissent, Justice Stephen Breyer said the time has come for the court to debate whether the death penalty itself is constitutional. Justice Ruth Bader Ginsburg joined Breyer's opinion. "I believe it highly likely that the death penalty violates the Eighth Amendment," Breyer said. More than 100 death row-inmates have been exonerated, showing that the death penalty is unreliable, Breyer said. He said it also is imposed arbitrarily, takes far too long to carry out and has been abandoned by most of the country. Last year, just seven states carried out executions, he said. In an extremely unusual turn, four justices read their opinions from the bench in the lethal execution case. Justice Antonin Scalia, part of the court's majority on Monday, read a brief reply to Breyer. "Welcome to Groundhog Day," Scalia said, noting that the court has repeatedly upheld the use of capital punishment. The Supreme Court's involvement in the case began in January with an unusually public disagreement among the justices over executions. Then, the court refused to block Oklahoma inmate Charles Warner's execution over the objection of the four liberal justices. In a strongly worded dissent for the four, Justice Sonia Sotomayor said, "The questions before us are especially important now, given states' increasing reliance on new and scientifically untested methods of execution." Eight days later, the justices agreed to hear the case of three other Oklahoma death-row prisoners. It takes just four votes among the nine justices to agree to hear a case, but five votes to place a hold on an execution. When the case was argued in late April, the justices engaged in unusually combative exchanges about the Oklahoma case and impassioned debate about capital punishment more generally. Among the conservatives, Alito said death penalty opponents are waging a "guerrilla war" against executions by working to limit the supply of more effective drugs. On the other side, liberal Justice Elena Kagan contended that the way states carry out most executions amounts to having prisoners "burned alive from the inside." In 2008, the court upheld Kentucky's use of a three-drug execution method that employed a barbiturate as the first drug, intended to render the inmate unconscious. But because of problems obtaining drugs, no state uses the precise combination at issue in that earlier Supreme Court case. Four states have used midazolam in executions: Arizona, Florida, Ohio and Oklahoma. Also, Alabama, Arkansas, Louisiana and Virginia allow for midazolam, but they have not used it in executions. Last April's execution of Clayton Lockett was the first time Oklahoma used midazolam. Lockett writhed on the gurney, moaned and clenched his teeth for several minutes before prison officials tried to halt the process. Lockett died after 43 minutes. Executions in Arizona and Ohio that used midazolam also went on for longer than expected as the inmates gasped and made other noises before dying. Meanwhile, the court challenge has prompted Oklahoma to approve nitrogen gas as an alternative death penalty method if lethal injections aren't possible, either because of a court ruling or a drug shortage.